I’m sure at one time, there must have been a subtlety to the lies and the art of lying from the media in Scotland, but that time has passed, and the mainstream media now are guilty of passing off blatant lies about the Rangers support without so much as a check and balance on sources, or the provision of any evidence. In recent months, one journalist has been exposed as a liar, and still remains in position. The Scottish Sun’s recent recruit from the Evening Times, Rebecca Gray, was exposed via an FOI to Police Scotland, and her article was proven to be a fabrication. Is it any wonder then, that the Daily Record and their own “crime” journalist Jane Hamilton, believe that it is acceptable to print an apparent Police attempt to blame the Rangers support OUTSIDE Hampden Park, as Police Scotland failed to do their jobs inside the ground? Firstly, it’s perfectly obvious that Police Scotland failed to do their job and contain a marauding Hibs support on Saturday, with pictures showing Police Officers standing with their hands behind their back while the Hibs fans ran past them. Secondly, as the Hibs fans ran all of 80 yards to the other end of the Park, while attacking Rangers players and robbing photographers, the Police looked absolutely clueless and their response was not fit for purpose. It’s really not difficult to conclude that the events on Saturday were initiated by Hibs fans, and woefully mismanaged by Police Scotland. Long term observers will remember rings of Police at many grounds in Scotland ensuring no pathway to the pitch for any support, and this was not the case on Saturday. As is the way with these things, the truth WILL come out, and we WILL find out whether this is Police Scotland attempting to shift the blame away from their own poor planning and management, or whether Jane Hamilton is following the lead of Rebecca Gray in fabricating her own story to paint the Rangers support in the worst light possible. Frankly, both scenarios are plausible, with Hamilton’s twitter account profile picture alongside Celtic captain Scott Brown, and tweets calling Rangers fans “Huns” (including one to former Celtic employee and namesake Tony Hamilton) suggesting she is far from impartial. I will give her the benefit of the doubt and not assume that Jane and Tony are related. Should it transpire that the source is indeed Police Scotland, it will indicate a very sinister diversion that will need to be addressed within the national force, and also highlight a propensity for journalists to publish stories without checking the facts first. Of course, the truth is yet to be established, but, I can’t be clearer in saying it will. No matter how long it takes. You’d think one blatant lie a day would be sufficient for the Rangers haters in the media, but not today. The Herald today have an interview with the “writer” of the “offshoregame” report on Rangers registration for European competition in 2011 that the vast majority of sensible journalists have run a mile from. Clearly, printing it “as is” would present significant issues, with even Alex Thomson calling it “toxic”, and based largely on the very questionable “Charlotte Fakes” twitter account, so Celtic supporting hack Neil Cameron (see the theme here?) has tried to work his way around the legal risk by interviewing the “writer” rather than publishing the report in all its cringeworthy glory. Unfortunately the writer of the report has already confessed on Twitter that the “report” was largely provided by Celtic Quick News owner Paul Brennan, who also funded the Project, with further involvement later from a number of other Celtic Supporters linked to the Rangers Tax Case website. 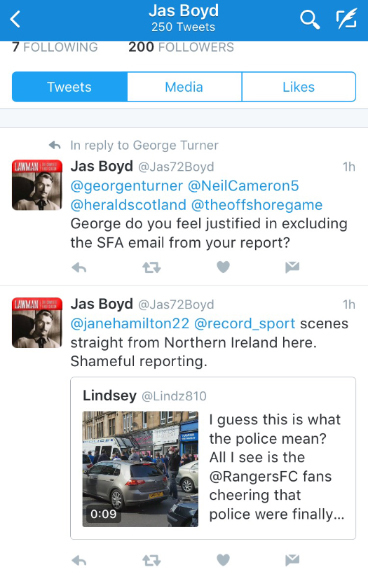 Of course, it goes without saying that the report is half baked, and has been debunked by the “TheLawMan” on Rangers Media not once but twice, with TheLawMan (aka @jas72boyd) asking a number of (unanswered) questions to the Record this morning on Twitter. I don’t know if those in the mainstream media have taken leave of their senses, forgotten that FOIs exist, forgotten that smartphones can record videos, or forgotten that the Rangers support have the resources and persistence to debunk lies about us, but perhaps it’s time they woke up and realised all of those things are real.